If Jim Carroll had any impression of me, it was as a drinking buddy of his one-time Bolinas housemate, Jim Gustafson. This was in the early 1970s, after Gustafson had followed Andrei Codrescu to California from Detroit. There was a period where Jim was working in the City in a car wash down on Lombard & after work he & I would work our way through the bars between his job & the Union Street scene. We’d walk past the location where the Gallery Six reading had taken place in 1955, but neither of us were ever entirely certain of just which building it was. Invariably, we’d eat at one of the establishments & there was often live music to be heard (once even Bonnie Raitt!). After we got tired, I’d head home, walking directly up the Fillmore Street hill & then down Sacramento. Gustafson used to aim to find some woman with a car who would drive him back across the Golden Gate, preferably to her place. I would marvel at how often he was successful at this. Gustafson invariably described Carroll as fragile, but two readings of his that I still remember hardly felt that way to me. The first was at Intersection, back when the arts program was still in the unused Methodist facility just down from the Art Institute in North Beach. Readings were in the basement & the place really had the Church coffee house vibe to it, as the audience sat at tables that crowded up against what passed for a stage. I have no memory of just whom Jim was reading with, but he was going first & reading works that would find their way into Living at the Movies. He mentioned heroin in the introduction to one poem and someone maybe two tables back said loudly, “You were a junky for an an hour & a half, just to get methadone.” Without another word or a second’s hesitation, Carroll leapt from the stage over the table this rube was at & had to be pulled off the fellow, who may have been quite a bit bigger than Carroll but was caught entirely off-guard. At least some basketball skills never go away, or so it seemed. When they were separated, the heckler was unceremoniously 86’d. After the upended tables were turned back upright & people had retaken their seats, Carroll continued reading as if nothing ever happened. The other reading was a few years later at Cody’s in Berkeley. Whoever was the emcee that night introduced Jim by holding up a copy of the Grossman edition of Living at the Movies, noting the cover by Larry Rivers (this may also have been on the cover of the edition Michael Wolfe brought out from Tombuctou before the Grossman “first edition” in ’73). “This is a book you buy for the cover, but keep for the poems,” the emcee said – I wish I could remember if that was Richard Silberg or not – while Carroll’s eyes widened & nostrils flared. After the reading, Carroll was still fuming. “I could punch him out. How could he say that about my book?” But no theatrics (or worse) ensued. So Gustafson’s sense of Jim Carroll wasn’t quite my own, tho I could see why Gustafson felt protective of him. While there was an undercurrent of anger, what I saw most clearly was Carroll’s shyness. And there was no doubt that Carroll always looked frail, regardless of his athletic abilities. 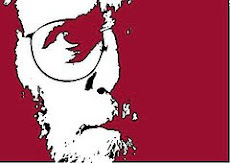 But what he was not, as I’d been warned earlier, was a naïf created rather out of whole cloth by Ted Berrigan. 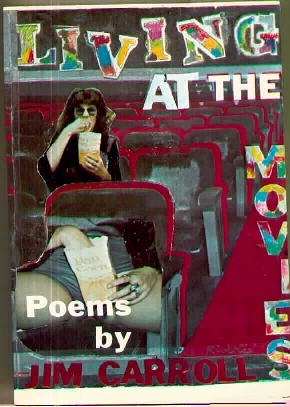 Living at the Movies was a decent book that fit right in with the range of 3rd generation New York School poetry. And if Patti Smith’s “I met him in 1970, and already he was pretty much universally recognized as the best poet of his generation” mostly makes you wonder what tiny universe she was inhabiting, Carroll himself had none of that hubris. His interviews – with Rolling Stone, Back Beat or the rest of the rather amazing collection you can find on Cassie Carter’s Catholic Boy website – are free of pretension. He’s frank about his limitations (and those of others as well), and clear that his influences place him in a context headed up by Ashbery & O’Hara more than the Beat scene he’s sometimes associated with just because that’s what rock & roll understands as poetry. I lost touch with Carroll once Gustafson & I stopped hanging out together, well before Carroll pulled the band together and briefly became famous – a rep that ramped up even further once a movie was made of the Diaries. For all of Carroll’s celebrity, the one major anthology that actually includes some of his work is Paul Hoover’s Postmodern American Poetry: A Norton Anthology, where Carroll is listed as having been born in 1951. Wikipedia until recently had him being born in 1950, before switching to what is apparently correct: 1949. David Shankbone’s accounts of Carroll fumbling around aimlessly at the Brooklyn Book Festival two years ago (here & here) suggest that recent years haven’t necessarily been as triumphant as some of this week’s obit-speak have made them sound. The only event listed in Catholic Boy’s roster of tour dates (meticulous for the past 14 years) after the Brooklyn fiasco was the 2008 Poetry Project New Year’s Marathon.